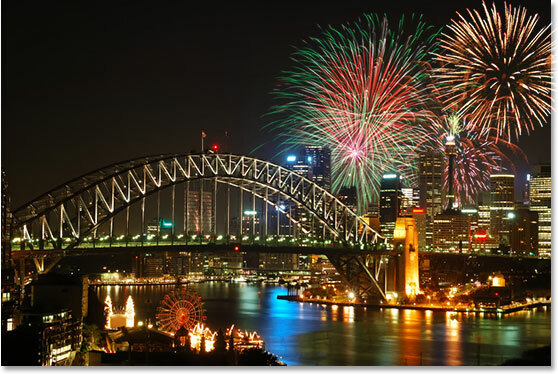 In this Photoshop Effects tutorial, we're going to learn how to add fireworks to a photo. 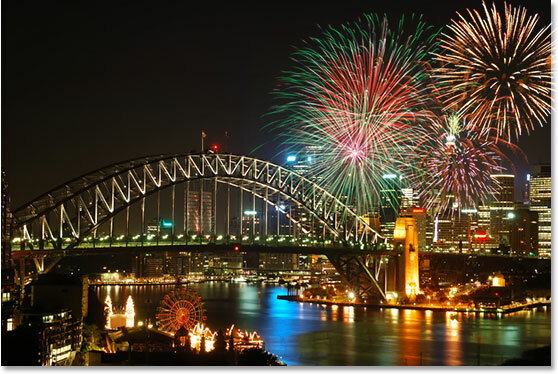 What you'll need is a photo of fireworks and the photo you want to add the fireworks to (preferably a nighttime shot, since fireworks tend not to look very impressive in the middle of the afternoon). Blending the two images together is easy. If you can paint with a brush and change a layer blend mode, you have all the Photoshop skills you need. Select the Move tool from the Tools palette, or press "V" for the keyboard shortcut. 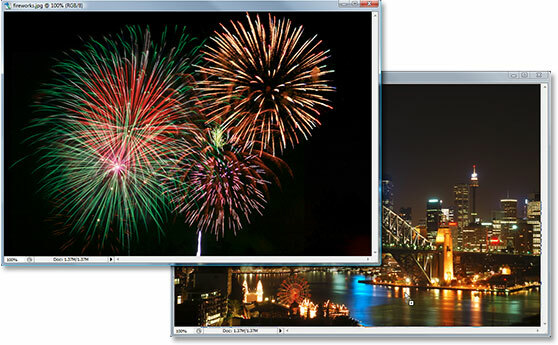 Click inside the fireworks photo and drag it into the other photo's document window with the Move Tool. Photoshop's Layers palette showing both images now in the same document, each on its own separate layer. 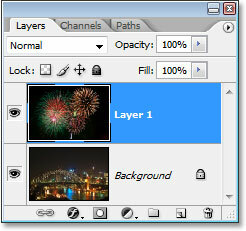 The fireworks photo is on "Layer 1". You can close out of the document window containing the fireworks photo by itself at this point, since we no longer need it. 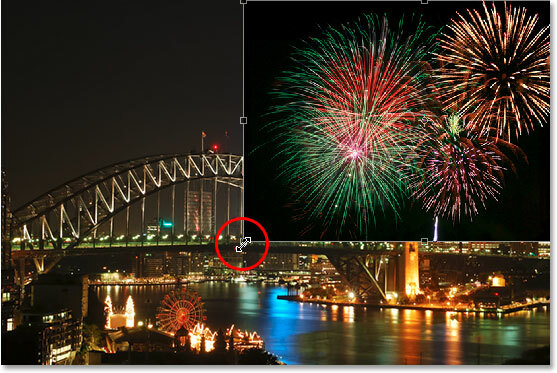 Now that we have the fireworks photo in the same document as the photo we want to add the fireworks to, we can move the fireworks where we want them and resize them if needed, and we can do both of these things at once with Photoshop's Free Transform command. With "Layer 1" selected in the Layers palette, use the keyboard shortcut Ctrl+T (Win) / Command+T (Mac) to bring up the Free Transform box and handles around the fireworks image. If you can't see the corner handles because part of your image is outside the viewable area, press Ctrl+0 (Win) / Command+0 (Mac) to fit everything on the screen. Then, to resize the image, hold down the Shift key, which will prevent you from accidentally distorting the width or height as you're resizing it, and then click and drag any of the four corner handles. 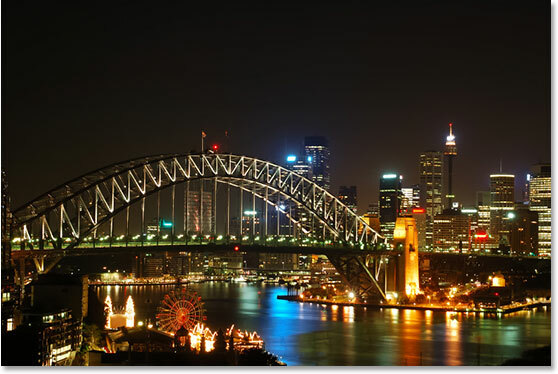 To move the image around on the screen, simply click on the image and drag it with your mouse. 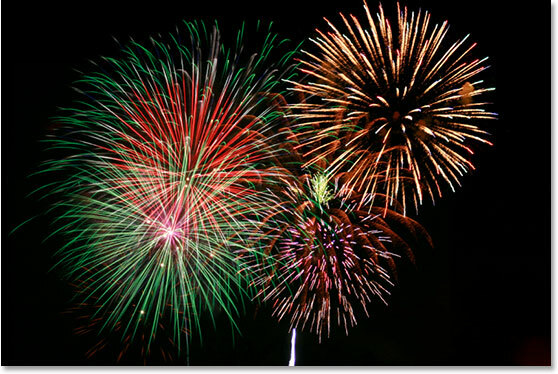 Move and resize the fireworks if needed with the Free Transform command. Step 3: Change The Blend Mode Of The Fireworks Layer To "Screen"
Change the blend mode of the fireworks layer to "Screen" to blend them in with the photo below. The image after changing the blend mode of the fireworks layer to "Screen". Click the "Add A Layer Mask" icon. 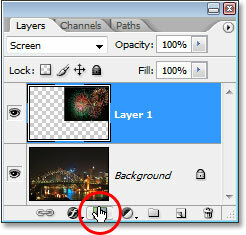 A layer mask is added to "Layer 1", with the layer mask thumbnail visible in the Layers palette. Lower the opacity of the fireworks layer so you can see the image behind it. Now that I can see the image easily behind the fireworks, I can paint with black over the buildings. Press the letter D on your keyboard to reset your Foreground and Background colors. Normally when you do this, you end up with black as your Foreground color and white as your Background color, but when you have a layer mask selected in the Layers palette, as we do, and you reset the colors, you actually end up with the exact opposite. White becomes your Foreground color and black becomes your Background color. We want black as our Foreground color, so to fix that, simply press X on your keyboard to swap your Foreground and Background colors. Paint with black over any areas where you need to hide the fireworks. If you make a mistake and accidentally paint over an area you didn't mean to paint over, just press X on your keyboard once again to swap your Foreground and Background colors, which will make white your Foreground color, and paint over the area to bring back the fireworks. Then press X to set black as your Foreground color again and continue painting. When you're done, if you've zoomed in on the image, press Ctrl+0 (Win) / Command+0 (Mac) to quickly zoom back out. 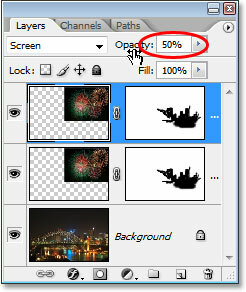 Also, set the opacity of the fireworks layer back to 100%. The fireworks now appear to be behind the buildings..
Press "Ctrl+J" (Win) / "Command+J" (Mac) to duplicate the fireworks layer and add more intensity to them. 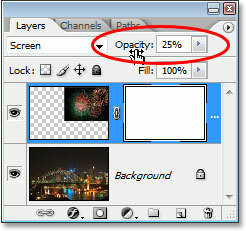 Lower the opacity of the duplicate layer to fine-tune the intensity of the fireworks. And there we have it! 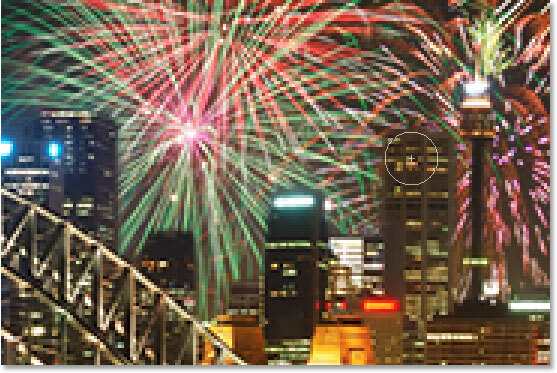 That's how to add fireworks to an image with Photoshop! Visit our Photo Effects section for more Photoshop effects tutorials!